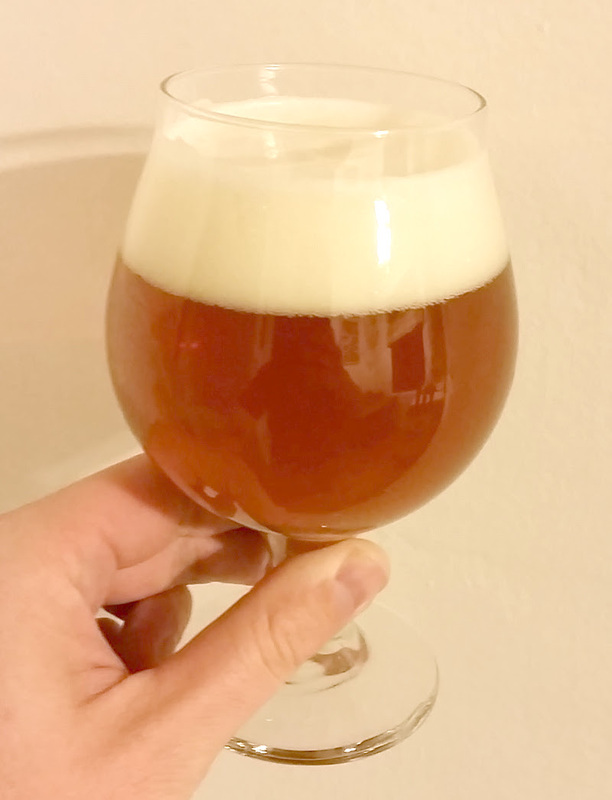 My Transatlantic IPA seems to be at its peak–no better time to give it a close look! The aroma is very hop-forward and pleasant, but not overwhelming. I pick up citrus (orange) and floral aromas, with a hint of fresh apricot. There is a faint malty aroma that comes through as the beer warms up. Relatively clear, with a minor bit of haze. The head is quite prominent, white in color, and fine-bubbled, with excellent retention. The beer itself is a beautiful gold color. This is a pretty well-balanced IPA. There is a low degree of malty flavor, with a slight caramel note to it, but not enough to take it out of character for what I intended. The hops are of course prominent, tending towards the floral and piney side of things. The bitterness is strong but not over the top, and it definitely has a piney and slightly resinous finish. I detect a very modest ester background, perhaps some of the stone fruit (peach/apricot) that characterizes the yeast strain. The beer has a medium body, with an appropriately moderate degree of carbonation. The finish is slightly dry, but not ridiculously so. Yes! This is a really nice “winter IPA”, and nails pretty much everything I was hoping for in the beer. I really like how the Conan strain plays against the hops and malt. Additionally, the hops combo stands up pretty well too. It’s complex, but not muddled. The beer is probably a bit heavier than I would want outside of the cold months, but that isn’t a flaw in my view. I was a little curious when formulating this recipe as to how much the Maris Otter base malt would show through–not much, in the end! It provides a good base, but doesn’t get in the way of the other ingredients.